Spheres and Splinters is a work for solo cello and electronics by Tod Machover that was commissioned for the Faster than Sound at Aldeburgh Music in November 2010. 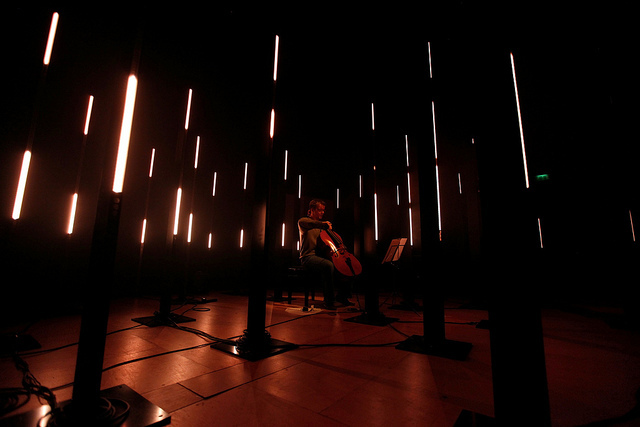 Bow sensing and audio analysis of the cello were used to affect audio processing, surround sound, as well as interactive visual elements. I created the interactive analysis, mapping, and visual software for this piece, adapting existing systems I had developed for Death and the Powers . 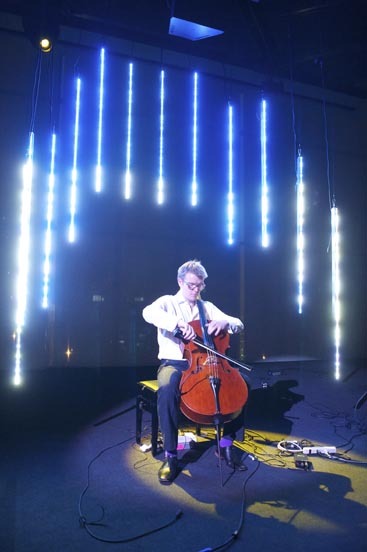 The system performed real-time analysis of the cello audio as well as interpreting seven channels of sensor data from a K-Bow. 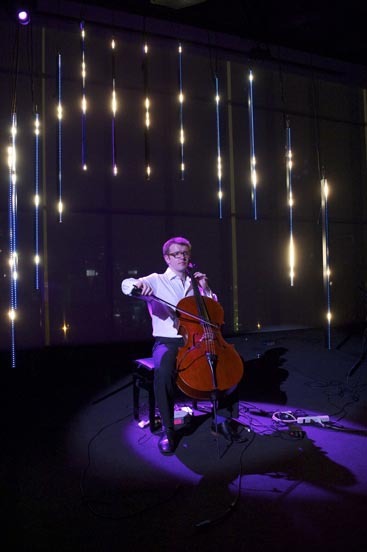 This information was mapped to numerous parameters and triggers that influenced the audio produced from and in addition to the cello's accoustic sound and control of LED strips throughout the performance space. Mappings were created for each movement of the piece to allow the cellist, Peter Gregson, nuanced and repeatable control over the resulting sound. I created the visuals for the 2011 U.S. Premiere, while United Visual Artists executed the visual elements for the world premiere. For this project, I also began work on a next-generation control system for ambisonic audio spatialization that interfaces with Opera of the Future's existing ambisonic infrastructure.